Whispers in the Loggia: Crisis? What Crisis? Its success in recruitment is in part due to the tightly knit Catholic community. "I can't imagine being a priest anywhere else," Schenkel said. Raised in Memphis, he recalls being pulled to the priesthood as young as 16, after being befriended by a young clergyman at his church. It's that person-to-person contact that has drawn many of his fellow seminarians into the vocation, he said. "They're not afraid to share with other guys their own story," he said. However, the forecast for Catholic priests in the area has not always been sunny. In the mid-1990s the diocese went six years without a single ordination. Bishop J. Terry Steib has since made a big push for attracting men into the priesthood. [Vocation Director Fr Keith] Stewart was assigned to oversee recruitment, and programs were created to reach high school seniors and college students. 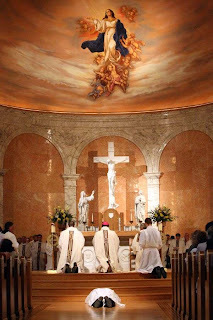 Hispanic Catholics are also part of the tide of priests entering the diocese. They make up half of the current seminarians and next year the diocese will ordain its first Hispanic priest. Stewart isn't shy to admit he's an aggressive recruiter. "I'm a firm believer that Jesus calls men to the priesthood," Stewart said. Nevertheless, there can be a lot of competing noise drowning out the call to serve, he said. "I just turn up the volume." ...meanwhile, in Tucson, the weekend's seeing the Arizona diocese of 350K adding not just four new priests, but commissioning the largest crop of lay ministers in its history, 22 in all.